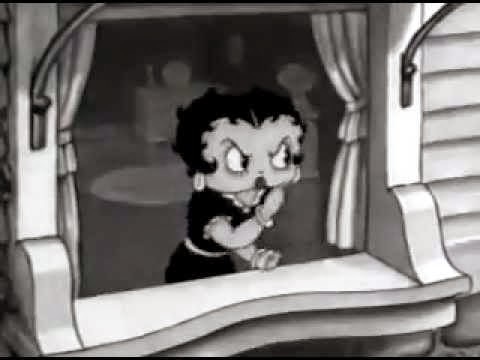 Betty Boop first appeared onscreen in 1930. After that, she was in a string of shorts for Max Fleischer and the Fleischer Studios that he ran with his brother Dave. This one, from 1936, was among the last. It has a strong political message about animal cruelty that you don't expect to see from the 1930s - but, then, many people back then lived much closer to their animals than is the case now, so issues like this were very common. Everyone knew about Animal Control, the only question was whether they did what they were supposed to regarding their animals - or hid it. This short "Be Human" also stars "Grampy," another cartoon star of the 1930s who, unfortunately, has been forgotten. But Betty Boop hasn't! She will be starring in a feature film from Simon Cowell's Syco Entertainment and animal studio Animal Logic Entertainment one of these days. This cartoon is from Fleischer Studios. It is a classic because it has the gorgeous animation that made Max Fleischer Walt Disney’s main competition at the time. Fleischer's studio came up with the Rotoscope technique that is used to this day. He actually had sound accompanying his animations before the first "talkie" in the 1920s. The Hays Code of 1934 forced Fleischer to tone down Betty Boop - there's nothing sexual about her in her later cartoons, unlike the first ones when she had plunging necklines and the like - and she lost her mojo with audiences. Fleischer lost control of his studio to Paramount during World War II, but continued to work here and there in the animation industry until the 1960s.